This bowl is a Xiajiadian Type Painted Pottery Bowl.The earthenware body is cold-painted with black, white and red design, reminiscent of the designs on bronzes. The bowl measures approx. 15.5 cm across at widest and 9.8 cm high. Weight 478gr. 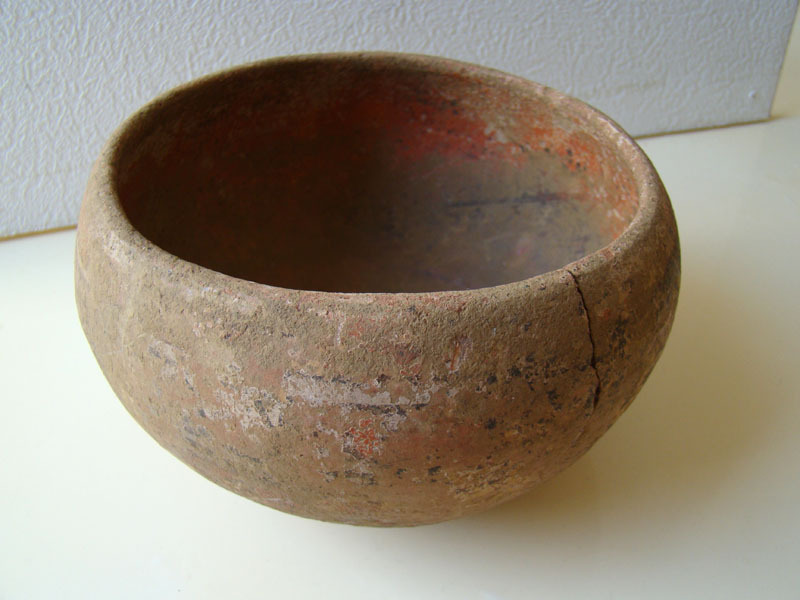 It dates to c2000-1500BCE, Bronze Age.Condition is damaged, signs of wear and use commensurate with age and as expected of this type of wares. Crack and hole in bottom, probably from a probe. There is a great earth smell on the piece,on a porous fragile body. The paint flakes and is covered with dirt. The Xiajiadian culture is divided in two periods, namely the upper and the lower Xiajiadian culture. 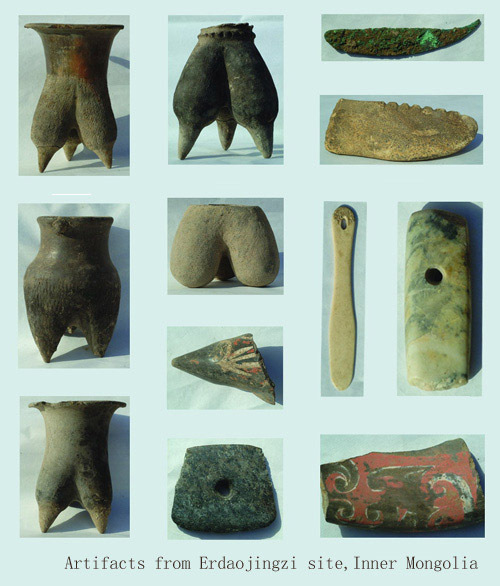 The Lower Xiajiadian culture (2200-1600 BCE) Upper Xiajiadian culture (1000-600 BCE). 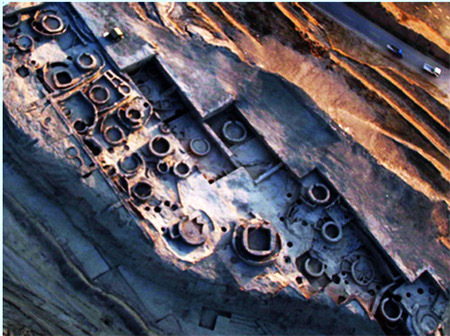 The culture was named after the village Xiajiadian near Chifeng in inner Mongolia. Their existence was based on farming, hunting and animal breeding. In the Lower X there were walled cities which were densely populated. The round huts have a diameter of two to three metres. Nearby the huts were storage pits,and also graves. Pottery in those graves often consisted of a set of orange-coloured vessels. 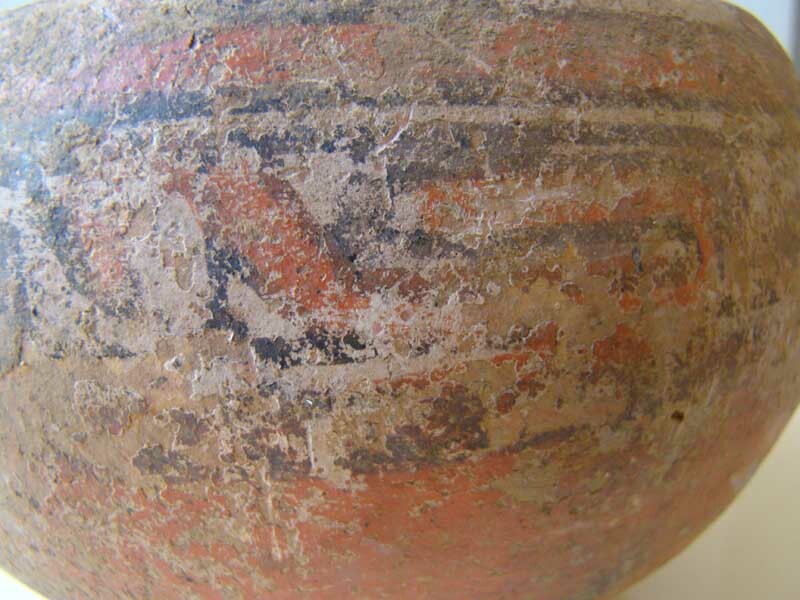 The orange paint means that they were meant for funerary purposes. As seen on my pot. Besides pottery artefacts ,stone, bone, gold, lead, lacquer, jade, copper and bronze artefacts are also found. The upper X. culture, compared to the Lower X. culture, had a lower population level, less dense, and more widespread. The culture still relied on agriculture, but also moved toward a more pastoral, nomadic lifestyle. The social structure changed from being a tribal society to a more chiefdom-oriented society. 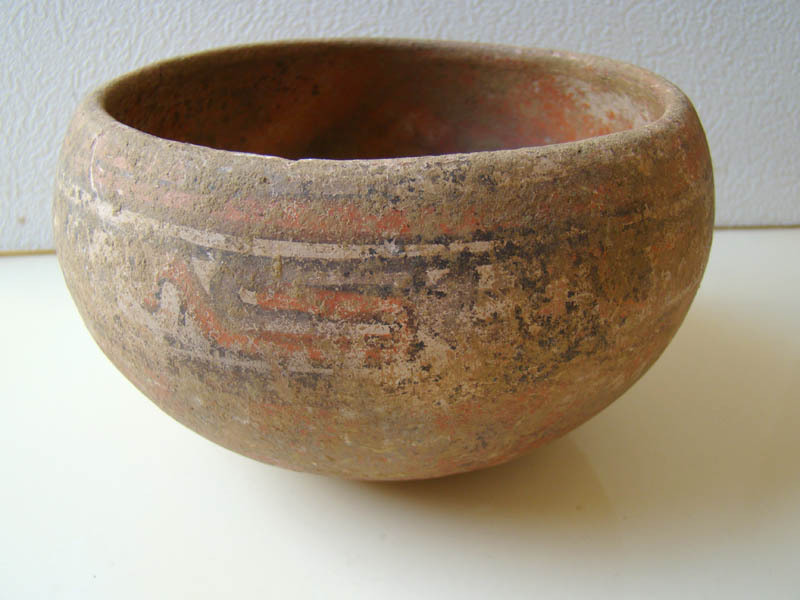 Compared to the example from the Harvard museum, my pot can be dated to the lower X. culture. These painted bowls are quite a rare find. Also see my Xiajiadian culture tripod elswhere on this blog. Thanks to; Mak.frankfurt, Wikipedia, Harvard museums, institute of Chinese archeology, Gotheborg.com. ← Qijia culture Li, or tripod.